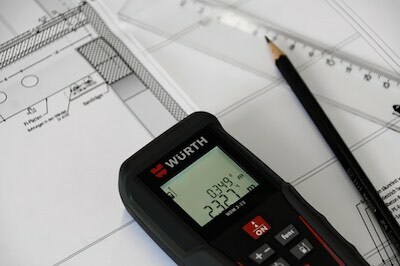 When it comes to measuring, forget the old school tape measure, now you can get measuring accuracy from a laser measure. Laser distance measurers are convenient, user-friendly, and very precise in terms of range and speed. These are great tools for commercial applications and appraisers. Here are a few tips on what to look for in the best laser measure and a few reviews to help you start shopping. 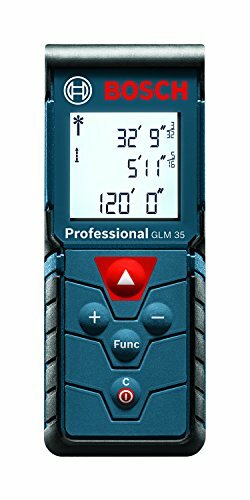 If you are looking for an outdoor laser measuring tool that is ready to take on anything, the Bosch GLM 50 C features both Bluetooth technology and an upgraded back-lit color display. 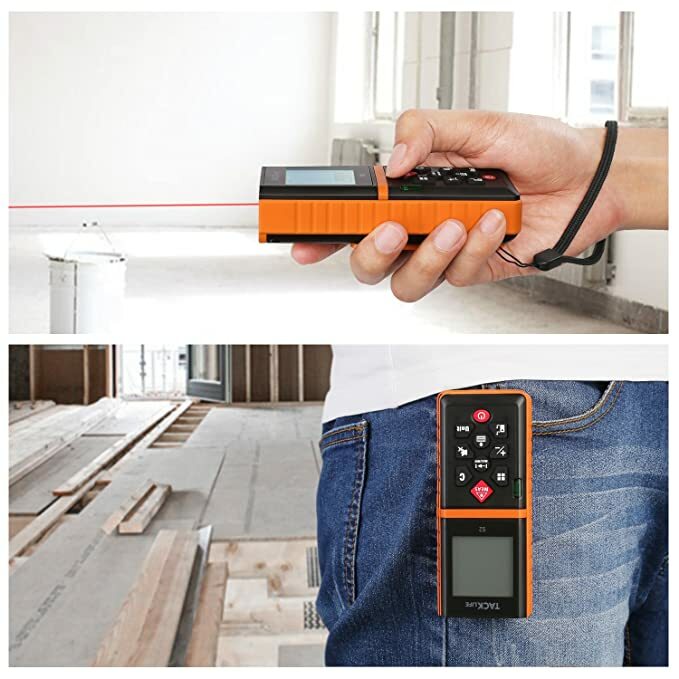 Compatible with both Bosch free apps that includes floor plan, document, and measure, this laser measure includes a lot of function including the basics of volume, indirect, area, length, and real-time length. The Bosch GLM 50 C has an all-around soft grip protection to help make the device a long-lasting product. The easy-to-use keypad guarantees fast operation and the well-lit display gives you more readability when looking at measurement. It can generate up to 10,000 measurements per battery supply and features a range of 165 feet and accuracy up to 1/16 inch. The Bosch GLM 50 C also includes advanced features like double indirect, stake out, minimum/maximum/ and angles which is easy to use with an intuitive user interface. There is a standard real-time measurement default so you can track measurements in relation to your target, plus it has stakeout measurement with pinpoints identified every six inches. This compact laser tape measure can easily fit into your shirt pocket, and the square shape plays into the overall functionality of the unit by making sure that it can measure in any direction on a flat surface. Compatible with a ¼ inch tripod thread, it is compatible to use with Bosch tripods with three measuring reference points center, front, and back that are designed to use with the tripods. 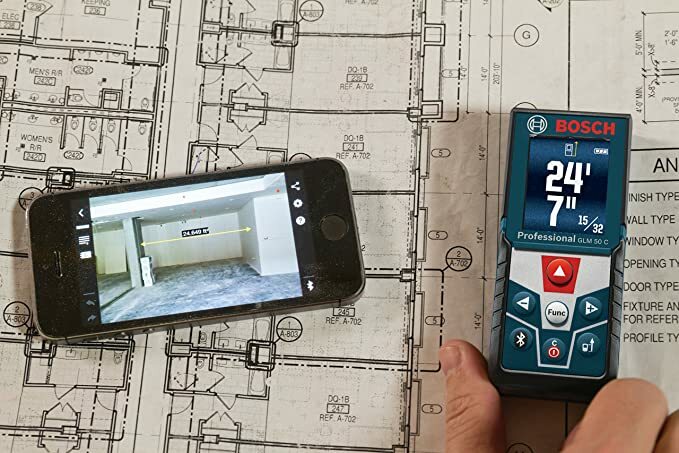 The Bosch Document and Measure App let you save and record measurements which can also overlap job site photos and lets you add notes. The Floorplan App lets you measure digital blueprints as well as create your own or modify an existing floor plan, and you can also store drawing and measured values in the Floor Plan app and email them to others. These free Bosch apps are Smartphone, iOs, and iPad compatible. 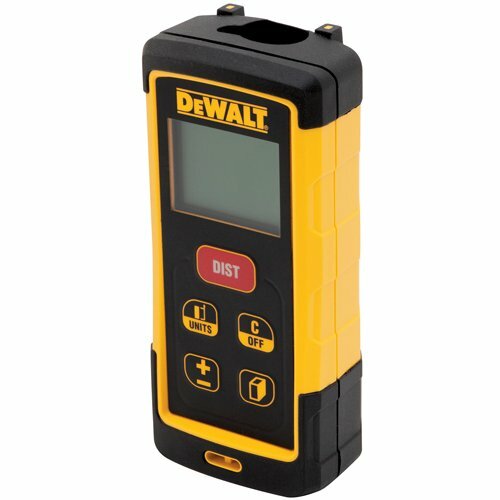 With the ability to calculate volume and area, the DEWALT DW03050 is a 165-feet laser distance measurer that quickly and easily make automatic calculations. Using Pythagoras to make indirect height measurement, you measure the distance between two points when then are u not accessible for linear measurement. Plus, it has a memory unit that can store the previous 5 measurements and a two-line display that is backlit to increase the visibility of the screen in dark or bright conditions. With a durable design, the Dewalt DW03050 features an over-molded casing and is IP65 water and debris resistant. It has an operating range of up to 165 feet and is accurate to within 1/16 of an inch. This is a Class 2 laser product that has automatic volume and area calculations. 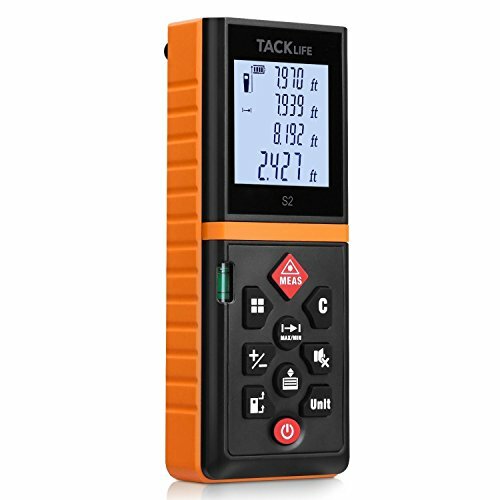 Portable and easy to use, the Tacklilfe HD60 Classic Laser Measuring device was designed for the high-precision distance measurements. Featuring versatile functions and a measuring range up to 196 feet, it is accurate to 1/16 inch and has a fast measurement speed that can improve your efficiency and productivity. This compact laser measuring tape has multiple functions so you can get your job done easily. It can calculate area and volume as well as height, width, and length, and its small size can fit right in your hand or pocket. The Tacklife Laser Measure is very durable featuring a waterproof level of IP54, plus it comes with a hand strap and soft portable bag. With free volume adjustment, you get better operation with various settings that include 30 groups of data memory, manually delete data, addition, subtraction, calibration, and it will automatically shut down without operation. You also get various measurement modes like area, volume, and distance as well. The laser level is perfect for large areas like warehouses, apartments, buildings, and construction sites. Giving you information at your fingertips, the Bosch Compact Laser Distance Measure comes in a small size but has tons of functions. Simple, compact, and easy to use, you can easily calculate volume, length, distance, and area with a measuring distance that extends to 120 feet. Bosch provides a precise and accurate measurement up to 1/16 inches, plus it has a backlighting feature so you easily see in the dark or low-light conditions. Similar to a tape measure, just activate the laser and you see it measure in real time as you move closer and away from the target. Bosch laser technology helps you be more productive while also being more precise and accurate at the job site. With an extensive range of lasers and levels, you get solutions for a wide range of projects with simple, one button operation. 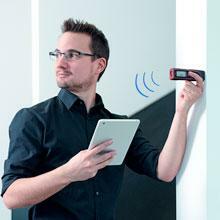 the Bosch Laser Measure is small enough to fit in your pocket. 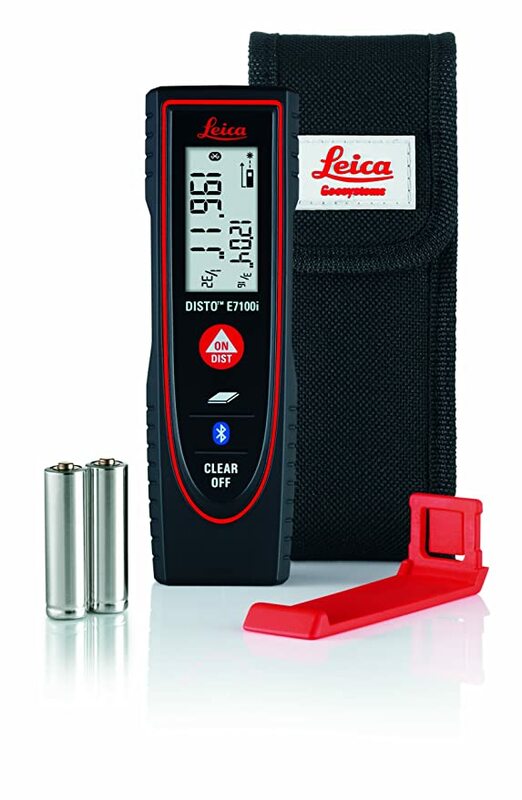 Featuring Bluetooth Smart 4.0 technology, the Leica Disto E7100i Laser Meter is only 4.75 inches long and weighs 3.25 ounces so it easy to carry or put in your pocket. 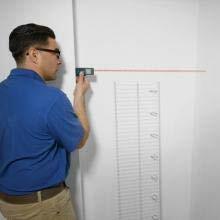 It can give you fast measurements for a home improvement project or a quick material estimate. Plus, it uses the free Disto Sketch app that allows you to send a value through a Bluetooth Smart connection to a smartphone or tablet so you can create floor plans, sketches, or document measurements on pictures you’ve taken. With its convenient shape and size, the Disto has an ergonomic design that allows it to fit right in your hand and is very comfortable to use. Intuitive buttons allow for fast and easy operations while the easy to read display gives you values to the 1/3”. You can choose either metric values, feet/inches, or inches/fractions to meet your project needs. The ISO-certified Leica Disto easily gives you the range of up to 200 feet and up to 1.5 mm accuracy you need to achieve your job objective, and it attaches to your pocket or belt with its handy removable pocket clips. It also includes a two-line display with a backlight for dark areas and has area calculations as well as continuous measuring mode. 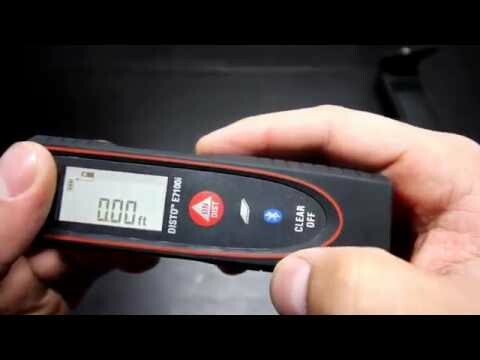 This is also an IP54 certified laser measure that is dust and water protected. With its Min/Max mode, you can easily swing the laser into corners and it will record the longest measurement which is useful for accurate window and door or diagonal room measurements. You can also use Area Mode to calculate the area of a square or rectangle in just two shots while the volume mode will add a third shot to determine volume. Featuring high accuracy, the Morpilot HM60 uses two bubble levels to give you more measurement precision than just one bubble. One bubble is on the level while the other is on the horizontal for more accurate measuring data. Accurate to just under 2 mm, it can measure distances up to 196 feet. Easily switch between meters, inches, and feet depending on your needs. The backlight screen is automatically lit to give you better low-light visibility, and it also has a mute setting so you can turn off the beep when you need to be quiet. The Morpilot HM60 has several measuring modes including the Pythagorean method, single/continuous measurement, addition and subtraction, volume, area, and distance. It also includes self-calibration, 30 groups data memory, and automatic shut down without any operation. When used as an outdoor distance laser meter, the Morpilot HM60 includes an enhancement target card and glasses to sharpen and increase the visibility of the laser line in the daytime. 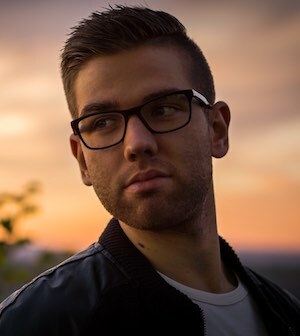 The durable laser enhancement glasses help you see red-beam leaser easier, and they are large enough to wear over normal eyeglasses. This is an IP54 waterproof design that provides more protection to the device with a comfortable keypad and rubber body that gives you a great user experience. This is a great tool for city planning projects, construction sites, and home décor. The included wrist strap allows you to hold the Morpiloe Laser Tape Measure steady while in use. Doesn’t work good in bright sunlight. The simple to use and portable Tacklilfe Advanced Laser Measure features versatile functions, particularly for distance measuring that requires high-precision. With Laser Precision Technology, you have a measuring range of up to 196 feet and gives you incredible accuracy up to 1/16”. With a fast measurement speed, the Tacklife helps to increase your efficiency at work and is versatile enough to work at construction sites, home décor projects, or in city planning. 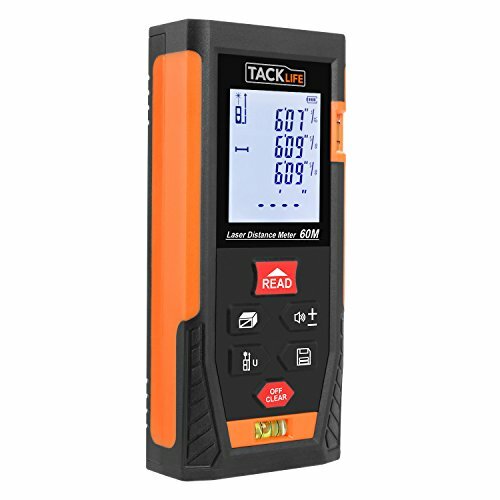 With the ability to contain twenty different historical values, the Tacklife Advanced Laser Measure lets you check past data easily and also manually delete unwanted data. It also features switchable measuring units between meters, inches, and feet staying on the last unit setting when the device is turned off. It includes several functions including self-calibration, subtraction, addition, and Max/Min Value. The Tacklife Advanced Laser Measure also gives you rear and front measuring reference support including Pythagoras Measurement, continuous measurement, auto area/volume measurement, and single distance measurement. The display features four lines and comes with a backlight so you can easily see it in the dark, plus you can mute the unit if you need to use it in a quiet place. This is a very portable device that features a hard rubber body so you can keep a good grasp on it. It has an IP54 waterproof level as well as a dust-proof function while the included wrist strap lets you keep the device steady and carry it easily. If you are looking for a faster, easier, and more accurate laser measure, the Bosch BLAZE GLM 20 laser measure gives you precise laser technology with a real-time measurement mode. You can take reliable and instant measurements from up to 65 feet allowing just one individual to complete a job in a few seconds. With a compact and square design, this laser measure is very portable and offers easy viewing with a back-lit display. This simple to use laser measure just needs a single button push to receive accurate measurements to within 1/8”. Automatically defaulting to real-time measurements, the Bosch Blaze Laser Measures gives you walk-off results like a tape measure with a lock available at the preferred measurement. 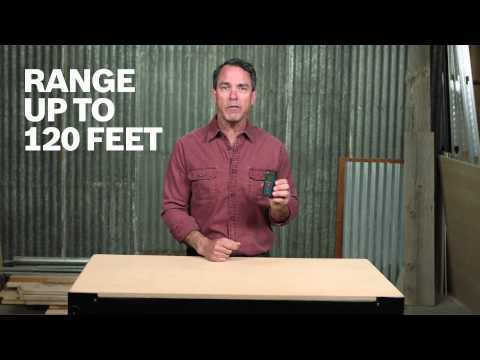 Weighing only 0.2 pounds and measuring four inches long, this laser measure will easily fit in your pocket and works well on any surface. You can measure either in inches, meters, or feet giving you tons of versatility while helping you get rid of guesswork and improve your productivity. The Bosch Blaze Laser Measure is perfect for dark corners and any hard to reach areas. 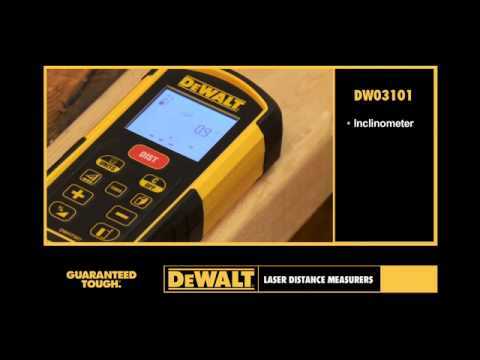 What is a laser distance measure? Also known as laser tape measures or laser distance meters, the laser distance measure is the new alternative to the old school tape measure. By sending out a pulse of laser light, measurements are taken to a set target and then the amount of time it takes for the reflect to return is also measured. This method gives you very precise reading, especially over a large distance. Plus, most devices have onboard functions that let you calculate volume and area as well as add, subtract, and triangulate. If you are doing difficult and time-consuming calculations, then this type of device will have huge advantages for you especially with its speed, accuracy, and ease of use. 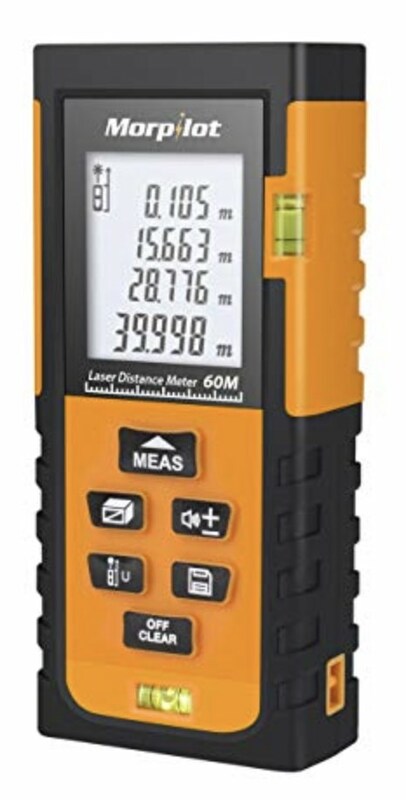 A high-quality laser distance measurer can be useful to a wide variety of professionals including contractors, kitchen fitters, tilers, surveyors, architects, and builders or any other profession where it is required to have accurate measurements. Durability, ease of use, and accuracy are the three main benefits of using a laser measure. The accuracy for a laser measuring tool is very high, particularly with some units that can have a full range of accuracy up to 1.5mm and cover distances of up to 200 meters. Making complex calculations like triangulation, volume, and the area is easier with on-board functions that lessen human error and save money and time. With just a click of a button, you can make simple distance measurements. For the more complex calculations, the laser measurer can either do these onboard or use extended software that is fairly easy to use. Laser tools are limited to distance so the range will vary depending on the model. As always, the overall accuracy will depend on how well you position or hold the laser measurement device. The laser measure’s accuracy represents how close is the measurement of the actual distance. When taking multiple data, pivot cautiously and hold the device steady. 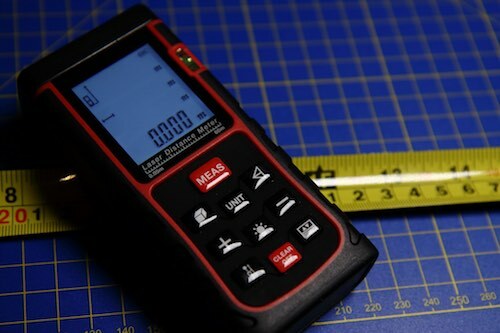 Most of the time, a laser measure should have an accuracy between 1/16 and 1/32 inches. When using a laser measurer for general area calculation, you will want a model that this accurate to¼ inches. For carpentry, landscaping, construction, and most DIY work, you will want a model with1/6-inch precision. High-end models should have a 1/32 inches precision when you are doing a high precision task like laying foundation, pipe, or road grading. There are specific functions that you want to consider when choosing a good laser measuring device. On average, most laser measurers can calculate volume, distance, and area while others can also calculate more advanced geometry. Another important function is continuous measuring which is very useful if you need to walk around measuring a large area. If you measure angles between surfaces like slanted ceilings, corners, or roof pitches, then you will need to look for angle measuring. Here is a list of function that you will want to consider for more complex projects. Another useful feature is the capability to store data taken from the laser measurement device, especially if you need it for later reference. You will find some models can store multiple data saving you time from having to stop and write down your own data. This is a very useful function, especially if you are working on a large or complex project. Visibility and display are two large considerations when choosing a laser measure tool. Most displays are hard to see in either dark areas or bright sunlight, so you need to look for a laser measuring tool that has a screen that is backlit. A backlit screen lets you easily read the display outside in sunlight or in dark areas. allows the user to read the display easily in the dark areas or outside at night. No matter what, the display should also be easy to read and clear. Find a laser distance measurer with replaceable or rechargeable batteries if you expect your laser measuring tape to work hour after hour. Battery life otherwise will depend on the type of battery and how much you use. It is also a great idea to find a model that has an auto shut-off mode to help increase battery life. When choosing a laser measure, make sure to consider whether it is water resistant, durable, and has a scratch proof screen, especially if you plan to use it outdoors. The days of needing someone to hold your tape measure are over. These are awesome tools for commercial applications, and, with their precision, range, and size, you can easily take on tons of commercial applications on your own.